While the states of Delhi, Punjab and Haryana were busy playing the blame game over the worsening quality of air after paddy harvest in October, three friends in Ludhiana had quietly found a solution. 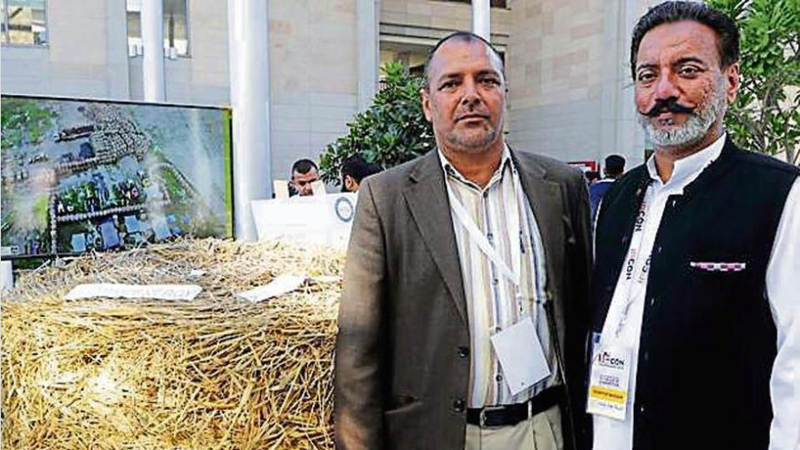 The hip stall with a cylindrical bale of paddy straw brings a whiff of rural Punjab to the very business-like atrium of the Indian School of Business (ISB). This is the stall showcasing Farm2Energy, a startup that claims to have found the solution to paddy stubble burning in Punjab. Sandeep Singh Shergill, straight out of a Punjabi film in his kurta pyjama paired with a waistcoat and waxed “mooch”, flashes an earthy grin as he explains in chaste Punjabi how he and his two brothers (it’s only later you learn they are childhood friends) Sukhbir Singh Dhaliwal and Kamaljit Singh bought their first baler in July 2016 and set up Farm2Energy Ltd.
Shergill, a graduate of the Government College for Men, Ludhiana, says they were wracked by guilt when they had to harvest 500 acres they had taken on contract. “It’s easy to set fire to 10 acres, but the dynamics change when you are looking at hundreds of acres,” he said. This, coupled with the poor quality of air, forced them to look for solutions. “We asked our friends abroad and they told us about the baler,” says Kamaljit, who imported a Rs 25-lakh baler from Italy. Looking for an end-to-end solution, they also set up a pellet-making factory at Khanna. Soon, the National Thermal Power Corporation (NTPC) was knocking at their door. “They pay us Rs 5,500 for a tonne of pellets,” says Kamaljit. Finding this business more profitable than contract farming, they bought seven more balers from Italy, Germany and Finland. Last year, they used their balers on 16,000 acres, 8,000 of which were paddy fields. One baler takes 10 minutes to make round bales from paddy stubble on an acre. Shergill says there was not a single incident of fire in Bhawanigarh in Sangrur district due to their balers last year. The partners claim they don’t charge any money from farmers queuing up for their services. “Farmers tell us their produce increased ever since they stopped setting the stubble on fire. Also, we help them save money they would spend on clearing the fields of soot,” says Shergill, who aims to work on 2,000 acres a day as maize and sugarcane stubble also needs a baler.